The Seafront Tea Rooms is a peaceful hideaway, away from the bustle of the seaside, and in this quiet place a group of women find exactly what they've been searching for. Charismatic journalist Charlotte is on a mission to scope out Britain's best tea rooms. She knows she's found something special in the Seafront Tea Rooms but is it a secret she should share? Kathryn, a single mother whose only sanctuary is the 'Seafront', convinces Charlie to keep the place out of her article by agreeing to join her on her search. Together with another regular, Seraphine, a culture-shocked French au pair with a passion for pastry-making, they travel around the country discovering quaint hideaways and hidden gems. But what none of them expect is for their journey to surprise them with discoveries of a different kind . . . 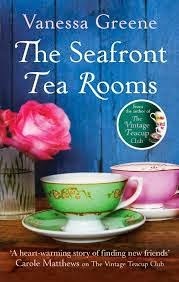 I have been longing to read a book by Vanessa Greene as I have heard so many positive things about her writing and what better way to start with her new release The Seafront Tea Rooms which sounds like my idea of heaven! This book follows a new friendship between Charlie, Kat and Seraphine who come together quite by chance in The Sea Front Tea Rooms. Each of the woman are going through a trying time and could really do with a shoulder to lean on and a friendship soon blossoms between the three women and they support each other. I love love loved this book. It had everything I look for in a great read, likeable down to earth main characters, friendships and romance, trials and tribulations and entertainment all weaved together in a perfect setting, what more could you ask for ........Tea and cakes! The book starts at a gentle pace as we are introduced to our three main characters. Seraphine is coming to England to try and improve her English and she will be staying with Adam and daughter Zoe to try and help Zoe to improve her French. Kat is a single mum to the lovely Leo but she is finding it hard to make ends meet and needs to find a job around looking after him. Then we have Charlie who has had her heartbroken so has put barriers up so high and had thrown herself into her work which is what brings her to the Tea Rooms as she is writing a review feature on tea rooms. Each of the ladies bring something different to the storyline and each of their stories are gradually weaved beautifully around each other. The descriptive writing when it comes to the various tea rooms was so impeccable that I could visualise and almost taste all these delicious cakes and teas in these quaint little places, this is definitely not one for anyone currently on a diet! The book has such a friendly cosy feel to it and the situations the women find themselves in are so realistic so it makes the storyline feel very believable. I had some suspicions as to what was going to happen but each time I was taken down a different path so this was an unpredictable words with plenty of little twists here and there. I enjoyed this books so much that I can't wait to go out tomorrow to get The Vintage Teacup Club because I just love this authors easy style of writing and beautifully delicate storylines. I would definitely recommend this book and it is one of my favourites of 2014.